Not only Ellen will worry about Sherman’s mental state. Soon, those concerned about him will be taking action. In Washington, Maj. Gen. George B. McClellan, commander of the Army of the Potomac, accepts Lincoln’s invitation to replace Lt. Gen. Winfield Scott as commander of all Union forces. Lincoln wonders out loud if McClellan can handle the tremendous responsibility, but the cocky Philadelphian tells him, “I can do it all.” It won’t be too long before Lincoln –and many others—will be wondering of McClellan can do anything. In Cairo, Illinois, Brig. Gen. Ulysses S. Grant, commander of the District of Southeast Missouri, spends a chunk of his day giving a deposition requested by the House Select Committee on Government Contracts. The committee is fulfilling its oversight function by questioning busy generals. Grant crisply answers questions about problems with some Austrian muskets (plenty), the beef being supplied his soldiers (not so good), hay being supplied army animals (not good, either), the financial condition of his quartermaster department (poor), and the nature of various boats attached to Grant’s command. Sickness ravages the camp of the 23rd Ohio in western Virginia. Maj. Rutherford B. Hayes writes a long diary entry, and also a long letter to his young son. Brig. Gen. Ulysses S. Grant writes to St. Louis headquarters about buildings in Mound City that could be used as hospitals for sick and wounded soldiers. Grant urges seizing them, as they are believed to be largely owned by Confederates. [More on this after your humble blogger returns from out of state in a few days.]. From western Virginia, Rutherford B. Hayes writes long letters to wife Lucy and Uncle Silas Birchard. Grant writes to Western department headquarters in St. Louis, reporting on the poor condition of his equipment. Sherman’s nightmares will not come true. Although the Confederates hold the southern edge of Kentucky—most of which they will lose in a few months—they will make no threatening moves toward Ohio for a year—and fail then as well. The 8th Ohio, of which young Sgt. Thomas Francis Galwey is a member, captures Mechanicsburg in western Virginia, then Romney. (Romney is located in the extreme northeast of West Virginia, not far from Harpers Ferry.) Joining the 8th Ohio is the 4th Ohio and three regiments of loyalist western Virginia infantry, as well as the Ringgold Cavalry from Pennsylvania. The people of Romney can be excused for growing exceedingly weary of the war. The little town will trade hands dozens of times during the conflict, and the local citizens will tire of trying to adjust to a change of authority every few months or oftener. After this, the 5th Ohio will occupy Romney for a time, but soon it will revert to the Confederates, only to be retaken by Union forces, and so on, for the rest of the war. Making up for lost time while he was in a meeting at Western Department headquarters in St. Louis, Brig. Gen. Ulysses S. Grant writes seven letters, including one to sister Mary. “I write in great haste having been engaged all evening in writing orders, and still having more to do,” he explains. Among his other concerns: modifying 4,000 foreign muskets "to make them serviceable," weighing a report that a regiment of cavalry is being organized in nearby Kentucky, and the need to congratulate the commanders who were victorious in the recent engagement at Fredericktown. With Union troops—the majority Ohioans—dominating western Virginia, the region's citizens feel sufficiently encouraged to go to the polls and vote overwhelmingly to break away from Virginia and form a new state. In May, a majority of western Virginians had voted strongly against the state leaving the Union to join the Confederacy. Then, in June, delegates from western counties met in Wheeling to denounce the secession vote and to authorize creation of a new state, to be known as “Kanawha.” A few weeks later, “Kanawha” was re-named “West Virginia” and it was decided to hold a public referendum in October on breaking away from the mother state. In voting today, 18,849 votes will be cast for separation from Virginia, with only 781 against. The presence of Union troops may have had something to do with the small number of opposition votes, but pro-Union sentiment probably would have prevailed anyway. Actual statehood will not come until Federal approval in 1863. Despite sporadic guerrilla and conventional warfare that will continue until 1865, it is clear that the Confederacy has lost a third of its keystone state—and Ohio soldiers helped make it possible. Elsewhere, a nasty little skirmish occurs at Camp Joe Underwood, an enlistment and training camp for Union loyalists in Kentucky. Several Union soldiers and some weapons are captured by Confederate forces from Tennessee. And there is news, not about the war, that is of national significance: The transcontinental telegraph is completed in the late afternoon today, with the joining, in Salt Lake City, of lines that had been built from the east and the west. “We are weaker and farther from our base, the Ohio River,” Sherman continues, briefly pausing to discuss a financial matter. Then: “I hope [Maj. Gen. Henry] Halleck will be sent to relieve me. I must stay here to direct all, but must share the fate of all in case of disaster, for we have no escape. I have been reinforced, but nothing like it should be. We should have 50,000 men here. “My health is comparatively good. The bad news about Col. Baker’s fatal encounter at Ball’s Bluff spreads throughout the North, but in Richmond, Confederate authorities are worried about their losses in western Virginia. There is considerable dissatisfaction over Gen. Robert E. Lee’s leadership there. The Union's embarrassment at Ball's Bluff (or "Leesburgh") dominates the war news, while its success at Fredericktown, Missouri, gets much less attention. Calm settles on Union forces west of the Appalachians. Called to a meeting at western department headquarters in St. Louis, Brig. Gen. Ulysses S. Grant is spared a day of writing reports and messages. In Kentucky, Brig. Gen. William Tecumseh Sherman takes pen in hand to write Adjutant General Lorenzo Thomas in Washington. “You know my views,” the ever-worried Cump writes. "This great centre of our fields [is] weak, far too weak, and I have begged and implored till I dare say no more.” In western Virginia, always sanguine Maj. Rutherford B. Hayes is enjoying the weather and waiting for something to happen—but when it does, he is sure Union forces will prevail. But even he looks eastward as he waits for decisive action in the war. Two battles occur today: one in the East, the other in the West. One turns into a humiliation for the Union, but is of no strategic significance; the other is a Union success that has at least some significance. The humiliation will be remembered a century and a half later; the success will be almost totally forgotten. Col. Edward D. Baker, a politician and friend of Lincoln’s, had been ordered to make “a slight demonstration” near Leesburg, Virginia. Brave but inept, Baker stumbles into a Confederate ambush at Ball's Bluff and, although the opposing forces are approximately equal in size (about 1,700 men each), the Union force is nearly wiped out. Federal losses are 921 killed, wounded, or captured, including Baker, who is killed. The Confederates lose only 149. 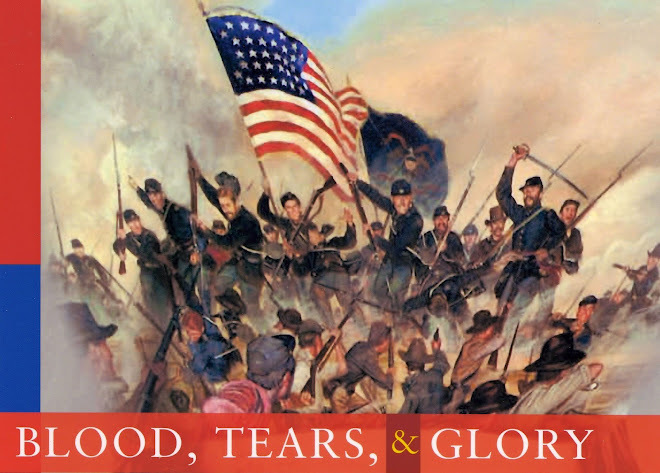 While Lincoln grieves for his friend and Northerners squirm in frustration over yet another loss, Southerners exult—and yet the battle has no strategic significance. Far to the West, in southeast Missouri, a larger engagement takes place at almost exactly the same time. Brig. Gen. Ulysses S. Grant had ordered Col. J. B. Plummer to take a force from Cape Girardeau and cut off forces of the pestiferous M. Jeff. Thompson in the area of Fredericktown. Meanwhile, a second column of Federals, under Col. William P. Carlin, heads for Fredericktown under orders from Department of Missouri headquarters at St. Louis. With two columns of Federals converging on him, Thompson takes his supply train to safety about 12 miles south of Fredericktown, then wheels about and heads back to take on the Union forces. He has between 2,000 and 3,000 men, while the two Federal forces total 4,500. Colonel Plummer assumes overall command of Union forces and launches a pursuit of Thompson who, in fact, is headed his way. Plummer and Thompson collide a mile or two south of Fredericktown and in fighting that proceeds by fits and starts, Thompson is pushed southward until finally he mounts a retreat. As usual, both sides make claims of casualties inflicted that are hard to verify, but this much is clear: Thompson has been forced to retreat, strengthening Union control of southeast Missouri. As usual, paperwork occupies part of Brig. Gen. Ulysses S. Grant’s day in his headquarters at Cairo, Illinois, but as is so often the case, he finds time to write to his beloved Julia at their home in Galena. He promises to send several copies of his photograph to her. Unlike McClellan, who remains rooted near Washington, Grant seeks action: “What I want is to advance,” he tells Julia. “I have been writing all day and have grown tired,” he adds, but still takes the time to ask her to “[g]ive my love to all our friends and remember me to all the neighbors. Kiss the children all round for me….Kisses for yourself dear Julia. Write often.” He closes playfully, “Your hateful husband. Ulys.” Quiet and solemn in person, Grant can be warm and expressive in his letters. Earlier in the letter he wrote, “We are all quiet here though how long we shall remain so is hard to tell.” Within 24 hours, his troops will see action. To his uncle Silas Birchard, in Fremont, Ohio, Hayes writes that he is coming to think a West Point education is less important that he had at first. “Good sense and energy are the qualities required…,” Hayes has decided. The comment hints at the condescension some West Pointers and volunteers fresh from civilian life have for each other. The lot of an army officer is often…paperwork. To manage his district, Brig. Gen. Ulysses S. Grant produces lots of it. He is commander of the District of Southeast Missouri, which extends northerly to Cape Girardeau and westerly to Ironton, both in Missouri. Also attached to Grant’s district are Cairo, Illinois; Fort Holt, Kentucky, and Mound City, Illinois. From his desk in his headquarters in Cairo, Grant sends a steady stream of messages. Today is a relatively light day: first, a reassuring telegram to Western Department headquarters in St. Louis reporting “reliable information” that the notorious Confederate partisan M. Jeff Thompson has fewer armed men in Grant's area than Union headquarters fears. Then a letter to St. Louis headquarters with information on other enemy activity (a movement in Kentucky, illegal Confederate shipping via Union steamers, possible mischief at Columbus, Kentucky). Grant explains that he has sent a gunboat a few miles south on the Mississippi to check out the rumored activity around Columbus. Finally, a letter to one of Grant's officers in the field ordering him to march on Fredericktown, Missouri, where that “ubiquitous individual” named Thompson is said to be throwing up fortifications. With his repeated raids, the energetic, ingenious Mr. Thompson (a former mayor of St. Joseph, Missouri) will prove a continuing trial to Grant. Today will be one of the most memorable in William Tecumseh Sherman’s military career—but it will not be a pleasant memory. Returning from a western inspection trip, Secretary of War Silas Cameron meets with Brigadier General Sherman in Sherman's bedroom at Louisville’s Galt House. Sherman had “begged him” for the meeting, believing it his chance to make the case for more support from Washington. Cameron is accompanied by six or seven newspaper reporters, a breed Sherman detests, but somehow the newsmen are allowed to sit in on a meeting that should have been private. Sherman will receive only a fraction of the troops he wants and his request will be referred to in Washington as “insane.” Newspapermen—who resent Sherman’s hostility to them—will soon be publishing throughout the country that Sherman is “insane, crazy.” And soon, the Ohioan's career will take a sharp turn. Brig. Gen. William S. Rosecrans has arrayed Union forces along a western Virginia turnpike in the Kanahwa region. Brigades are stationed at intervals from Gauley Bridge eastward ten miles along the turnpike. Robert E. Lee has settled his forces a few miles away. For the moment, both sides seem content to watch and wait. Rosecrans’ commanders include several Ohioans. Brig. Gen. Jacob D. Cox is in charge of the District of the Kanawha, while his brigade commanders include Cols. Robert C. Schenck, Robert L. McCook, and Eliakim Scammon—Ohioans all. Elsewhere in western Virginia, a Union force composed of several regiments, none from Ohio, gets into a lively little scrap at Bolivar Heights but escapes to return to safety at Harpers Ferry. Overall, however, it is a slow day for Ohio soldiers almost everywhere. In Kentucky, Battery F of Ohio’s 1st Light Artillery is involved in a skirmish near Wildcat Mountain. Skirmishes can turn into major engagements but often they amount to little more than a few shots fired and a lot of nerves jangled. So goes the life of soldiers—long intervals of drudgery interrupted now and then by moments of terror. War news appears throughout The Cleveland Morning Leader today. Ohio has 55,000 men “in camp and field,” with 36 regiments already sent outside the state while still more are in training camps throughout Ohio. Within the past 10 days, the 2nd, 14th, 15th, 17th, 31st, 35th, and 49th infantry, as well as two artillery batteries, have been dispatched to Kentucky. The 37th and 44th infantry have joined the numerous Ohio regiments already in western Virginia. A man returning from Rosecrans’ headquarters in western Virginia reports “all is quiet along the Kanawha [river].” Less cheering is news that two steamers have arrived at Cincinnati with 206 sick soldiers from the Kanawha region. In Ravenna, the body of a soldier who died in the Kanawha region from sickness—probably typhoid or cholera—arrived home for burial in a local cemetery. From Harpersfield in Ashtabula, 84 out of 260 registered voters are reported to be in the military. Printers at The Leader have presented a sword to Capt. John H. Williston, one of their own who had joined the service. At Cairo, Illinois, Gen. Ulysses S. Grant has refused a Confederate offer to exchange prisoners. Grant says he does not “recognize the Southern Confederacy,” but will check higher authority on what to do. After his men from the 47th Ohio, based in western Virginia, surround the house of a Confederate ally named Nutter, Capt. Tom Taylor enters Nutter’s home in the early morning hours and finds him hiding under a bed. Taylor orders him out—“the wildest looking man I ever saw and all from fright”—and turns him over to the soldiers, who bind his hands. The Ohioans move on, arriving outside the home of the reputed chief of the rebel scouts, Capt. John T. Amick, a man notorious for his depradations aginst Union forces. When Amick attempts to flee, Taylor fires and seriously wounds the Confederate in the back. Taylor has Amick returned to his home, bandaged, and left there, probably to die from his wounds. Still behind enemy lines, Taylor’s men push on, search a number of houses and capture one “secesh.” Tomorrow, Captain Taylor and his men will return to the 47th Ohio’s camp, where they will receive the congratulations of their fellows. In western Virginia, the adventure-hungry Capt. Tom Taylor of the 47th Ohio sets out to strike back at bushwhackers plaguing Union forces while Confederate regulars lie low. Armed with rifle, revolver, and bowie knife, Taylor leads a force of 15 soldiers, plus a lieutenant and two local guides. Taylor’s expedition leaves in the morning and by midnight is approaching the house of a notorious Confederate civilian guide named Nutter. Beginning with Nutter, Taylor will lead his little force on two days of marauding behind enemy lines. By the 16th he can sit down in camp and write wife Netta about what happened. From Louisville, Brig. Gen. William Tecumseh Sherman writes “Dearest Ellen,” who is concerned about the worrisome tone of Cump’s recent letters. On October 10, she wrote him, “Do write me a cheerful letter that I may have it to refer to when the gloomy ones come.” It was not to be. Cump’s response: “How any body could be cheerful now I cant tell….the forebodings of danger against which I have struggled keep me far from being easy.” Then follows a litany of his military problems. Personally, however, his health “is very good though I have a headache from smoking too many cigars, and being kept down to a table writing.” Once again, he warns Ellen not to move to Cincinnati, apparently fearing Ohio's largest city is vulnerable to Confederate attack. Brig. Gen. William Starke Rosecrans officially takes command of the new Federal Department of Western Virginia. He had been ranking officer there since July 22, when Maj. Gen. George B. McClellan was called east to take over the main Union army, demoralized after its defeat at Bull Run. Rosecrans is yet another colorful character in a war that’s full of them. Born in 1819 in Delaware County, Ohio, he graduated from West Point in 1842, fifth in a class of 56 students. He left the army in 1854 and ran a mining business in western Virginia. The explosion of an oil lamp in 1859 badly burned Rosecrans, leaving his face with a “perpetual smirk,” according to one observer. At McClellan’s behest, he returned to the army in 1861 and in July was the architect of a Confederate defeat at Rich Mountain. Although McClellan took all the credit for the victory, Rosecrans’ career was on the ascent until his mistakes resulted in an ignominious loss at Chickamauga in northwestern Georgia. Friendly to his troops (and affectionately called "Old Rosy" by them), Rosecrans was an excitable man whose speech became a kind of chatter during battle. In camp, he was apt to keep his staff up much of the night while he, a convert to Catholicism, discussed theology. Elsewhere, Brig. Gen. Ormsby M. Mitchel, the “astronomer-soldier” from Cincinnati, commander of the Department of the Ohio from September 21 until November 15, receives orders to send an expeditionary force into Secessionist eastern Tennessee. Lincoln covets the region because Union loyalists abound there, trapped in a Confederacy they do not support. Anxious to see some action, Capt. Tom Taylor of the 47th Ohio has gratefully taken up leadership of “nocturnal scouts” in the wild countryside of the Kanawha region of western Virginia. These dangerous missions are aimed at discouraging Rebel guerillas, known as “bushwhackers.” Taylor’s men take prisoners and confiscate horses and livestock. A proud Taylor writes wife “Netta” in Ohio that, “I am quite famous on the scout with this portion of the regiment.” A worried Netta is, no doubt, less than pleased. In Kentucky, Brig. Gen. William Tecumseh Sherman unhappily takes over the Union Department of the Cumberland from Brig. Gen. Robert Anderson, who is suffering from nervous exhaustion. Sherman himself is in a state of nervous anxiety, in no condition to take responsibility for a region where he see dangers in every direction. Sherman’s command will not end happily. In western Virginia, cold, wet weather plagues Ohio’s soldiers, and sickness spreads. Forty men of the 7th Ohio are reported sick today, including 1st Lt. William H. Robinson of Company G, which had been organized in Ravenna. Robinson dies later today and is taken to Grafton for burial. Elsewhere in the Kanawha region, Maj. Rutherford B. Hayes of the 23rd Ohio writes wife Lucy of his experiences in the past 24 hours. While he was working in the rain, helping load sick men into wagons for transportation back to Ohio, word came of an “enemy attack.” Hayes rushed three-quarters of a mile from the hospital to his camp, only to find the alarm arose from no more than an enemy scouting party driving in the Union picket guards. In the meantime, many sick soldiers, panic stricken, fled the hospital, going three or four miles down the road during the rain in a needless attempt to escape. Maj. Rutherford B. Hayes of the 23rd Ohio writes his wife, Lucy Hayes, in Cincinnati. “Don’t worry about the war,” he tells Lucy, no doubt in vain. “We are doing our part, and if all does not go well, it is not our fault. I still think we are sure to get through it safely. The South may not be conquered, but we shall secure to the nation the best part of it.” But death can find the Civil War soldier more quickly off the battlefield than on. Hayes admits the regiment has “sixty [sick men] to send to Ohio. This is the severest thing of the campaign. Poor fellows! We do as well as we can with them; but road-wagons in rain and mud are poor places.” By now, the 23rd Ohio needs to recruit replacements, as Hayes expects the regiment will be 100 to 150 men short when the current campaign is ended. By the end of the war, twice as many soldiers will have died from sickness as from wounds. Elsewhere, two Federal gunboats exchange fire with Confederate shore batteries on the Mississippi, near Columbus, Kentucky. Secretary of War Simon Cameron heads west on an inspection trip that will eventually take him to a fateful meeting with Brig. Gen. William Tecumseh Sherman in Kentucky. In Washington, Lincoln wonders whether the problematical Maj. Gen. John Charles Fremont should retain command of the Western Department. Some time this Sunday—probably in the evening, when the day’s duties are finished—Brig. Gen. William Tecumseh Sherman sits down to write a letter to his wife, Ellen Sherman, back in Lancaster, Ohio. Almost every paragraph is freighted with gloom. The “secessionists are armed and flocking” to the Confederate forces. Kentucky’s loyalists won’t fight. “The weather is now cold and miserable.” Because of selfish special interests, “honesty & qualifications are no longer the rule” in appointing officials. Ominously, Sherman writes that he is living in a house, “but am up all night” and “I don’t think I ever felt so much a desire to hide myself in some obscure place….” The question now is: How serious are his worries? Brig. Gen. William Tecumseh Sherman, second in command in Kentucky, writes his younger brother John Sherman in Ohio. John is busy recruiting troops, hopes to lead his own regiment, and believes eastern Kentucky is loyal to the Union, even if fighting will be required in the western portion of the state. Cump seems to have slid into a slough of despond. "I am afraid you are too late to save Kentucky," he writes. The loyalists seem unwilling to actually do anything on behalf of the Union, Cump complains, while secessionists are very active. "The people are all unfriendly," he claims--surely an exaggeration. "I am far from easy about the fate of Kentucky," he tells John. "I hope you will be successful in raising your regiments, but it will be too late." In London, diplomatic recognition of the Confederate States of America is becoming a hot topic. The Post thinks it would be a good idea, while the Times seems to favor the Union. Diplomatic recognition of the CSA by the British government would go a long way toward legitimizing the Secession in the eyes of the world, and be a blow to the Union. In Lynchburg, Ohio, a group of 60 enthusiastic volunteers begin drilling at “Camp Harvey,” a local warehouse donated for the purpose by Mr. Josiah Harvey. They were sworn into the service yesterday by local school teacher John W. Frazee. Beginning in late summer, the energetic Frazee had rounded up recruits, then gone to Columbus to secure a captain’s commission. The men will practice what they fondly believe are the military arts until they are ordered, in 10 days’ time, to a real military camp: Camp Dennison, near Cincinnati. There they will become part of the 48th Ohio. Today is the 39th birthday of Rutherford B. Hayes, major of the 23rd Ohio, now serving in western Virginia. On this "warm day with clouds gathering," Hayes enjoys a birthday dinner with Brig. Gen. Robert C. Schenck, who has just taken command of Hayes' brigade. An Ohioan like Hayes, Schenck is celebrating a birthday of his own: he is 51. Near Washington, President Lincoln watches a balloon demonstration. Thaddeus S. C. Lowe, a New Hampshire man who had long been fascinated with the idea of air travel, is the Union’s expert on balloon travel. Lowe will eventually conduct several balloon reconnaissances for Union generals, only to resign in 1863 over frustration with the army bureaucracy. At first glance, the pages of the Cleveland Morning Leader seem filled with the usual hodgepodge of old and less-old news, some of it meaningful to only a few readers: In Ravenna two earlier, a banker named George W. Woodward married Anna Lyman, daughter of a judge. Advertisements fill up to half of each page, including the first, where “Decker’s Fine Arts Hall” at 205 Superior St. offers “photographs, ambrotypes, and every style of sun picture.” If you lack the money to have a “likeness” made, you could go down Superior Street and around the corner to 3 Water St., where William Wagner offers “money advanced in sums to suit” in exchange for “security of every kind”—from pianos to carpets to “fire-arms.” But the war is increasingly intruding into the paper: the lead opinion piece urges voters next week to vote for candidates who support continued war, not peace with the South. “There are thousands of semi-secessionists in the state,” the essay snarls, calling them liars and appeasers. “There can be no honorable peace without war first,” the editor concludes. Elsewhere, a short article announces that the 3rd Ohio Cavalry commanded by Col. Louis Zahm will be buying horses daily for service in the war. And the Soldier’s Aid Society, a women’s organization at 95 Bank St. (“We calm the sick and wounded soldiers”) appeals for donations of hospital bedding, towels, dried fruits, jellies, and other useful items. Can anyone supply more information about the fight at Kessler's Cross Lanes on Aug. 26, 1861? Was Colonel Tyler ever disciplined for positioning his troops so poorly? Secretary of the Treasury Salmon P. Chase has returned to Washington from New York, where, according to the New York Times, he “established perfect harmony between the Government and the capitalists of the country, and made certain that we will not be embarrassed by an empty treasury.” An Ohio lawyer, Chase’s most important job is to secure financing for the war effort, a task he will do well, despite an almost overwhelming hunger for the presidency, a yearning that gnaws at him night and day. A widower, Chase has a beautiful and charming young daughter named Kate, who serves as his social secretary and who does her best to advance his ambitions.